In a 1995 editorial cartoon, a man holds a sign with an arrow: “Access This Way.” That arrow points to a banner: “Government of the Corporate—Buy the Access for the Power.” Another banner contains an alphabet soup of acronyms: CSG, NCSL, NGA, WLC and ALEC. Few politicians need to Google the letters. The acronyms stand for organizations whose mission is to bring corporations and lawmakers together. Ross Perot’s Utah newsletter, which ran the cartoon, was aiming at them. In 1995, there was no catalyst like the Trayvon Martin killing in Florida, and the cries from Perot’s United We Stand newsletter were summarily ignored. “We’ve been trying to get the state to pull out of these organizations forever,” says citizen activist Claire Geddes, who ran Perot’s Utah campaign. “These representatives don’t even see the problem with this. Our government has gone so far wrong that they believe this is right—and it’s fascism. “Everyone talks about socialism, but we’re promoting corporations above the individual, and people ought to be horrified,” she says. Instead, Utah has put out the welcome mat for ALEC, the American Legislative Exchange Council, which is holding its 39th-annual meeting in Salt Lake City from July 25 to July 28. ALEC was founded in 1973 by conservative kingmaker Paul Weyrich. Weyrich’s original goals were to flag issues for state legislators about abortion, the Equal Rights Amendment and D.C. voting rights. However, the interests of monied corporations soon took center field. Under the Reagan administration, ALEC began as a “clearinghouse” of ideas, but developed task forces as stand-alone think tanks, and began actively soliciting input from the private sector. Today, that includes corporations like AT&T, Pfizer and Koch Companies Public Sector, to name just a few. ALEC calls itself “a nonpartisan individual membership organization of state legislators which favors federalism and conservative public-policy solutions.” One of those conservative public-policy solutions was a bill modeled after Florida’s “Stand Your Ground” law, which neighborhood-watch volunteer George Zimmerman is citing in defense of the Martin shooting. Zimmerman maintains that he feared the hoodie-clad Trayvon Martin and ultimately had to shoot him to protect himself. Martin’s attorneys say Zimmerman stalked and provoked him. Stand Your Ground is just one of perhaps 1,000 pieces of legislation modeled by corporations for state legislatures. They include bills on worker and consumer rights; privatizing schools; environment, energy and agriculture; and democracy, voting and federal regulations. ALEC provides what they call “off-the-shelf” language for legislation. In other words, one state will offer up its law as a template for other states. Some of the more notable laws besides “Stand Your Ground” include “Three strikes, you’re out,” which requires state courts to impose life sentences after three serious offenses; “mandatory minimums,” which limits judicial discretion in sentencing of certain crimes; “truth in sentencing,” which is intended to limit or abolish parole; “right to work,” which gives workers the right to choose whether or not they join a union (and to which Utah subscribes); and the “Animal & Ecological Terrorism Act,” which criminalizes violence or sabotage committed by activist groups. In the wake of the Trayvon Martin shooting, ALEC decided to discontinue its law-enforcement task force. And 20 corporations and a handful of nonprofits have discontinued their affiliations. 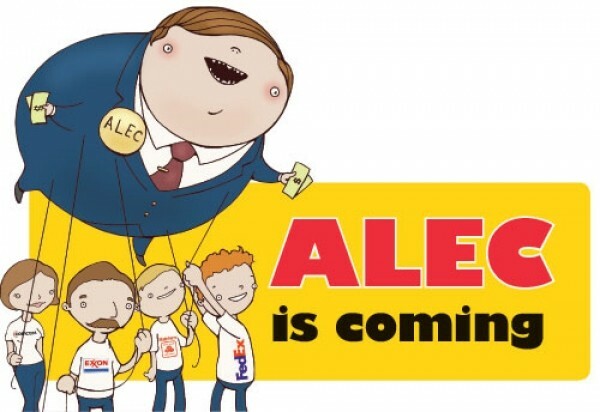 While bad PR is a powerful motivator, it’s not enough to dissuade ALEC’s enthusiastic Utah supporters. 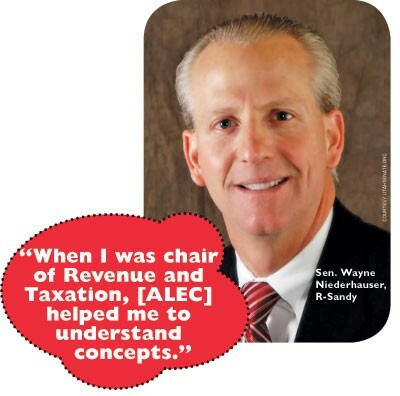 Sen. Wayne Niederhauser, R-Sandy, is one of the state chairmen for ALEC. Appointed to the Legislature in 2006, he first got involved with the National Council of State Legislatures (NCSL). There are, in fact, three main legislative organizations in the country—NCSL, the Council of State Governments (CSG) and ALEC. Still influential, but less all-encompassing, are the Western Legislative Conference (WLC), sponsored by CSG, and the National Governors Association (NGA), which shares best practices among governors. By Niederhauser’s second year, he’d become an ALEC cheerleader. Niederhauser is also interested in streamlined sales tax and worked on a resolution with Rep. Wayne Harper, R-Taylorsville, and Sen. Curtis Bramble, R-Provo, to solve the Internet sales-tax issue. Not only did it fail in the Legislature, but the ALEC board also rejected the legislation, says Bramble, who’s on the boards of both ALEC and the Streamlined Sales Tax project. Niederhauser calls the issue “too nuclear,” but he and Bramble plan to bring it back. Critics worry that solutions are being hammered out in private, since ALEC is a private-membership organization. But Rep. Ken Ivory, R-West Jordan, dismisses the criticism. “Ridiculous,” says Ivory, who’s the second state chair for ALEC. ALEC is a think tank, he says, and all think tanks require money to pursue their aims. Whatever the genesis of a bill, it must go through the public process of the Legislature, he says. That includes committee hearings, floor debate and, ultimately, the governor’s signature. And yet ALEC’s influence is indisputable, its motivations suspect. Ivory draws a straight line from the model legislation of ALEC to the halls of the Capitol; he’s apparently not enough of a conspiracy theorist to see all the arterial paths. In contrast, Mike Elk, contributing editor at The Nation magazine, knows how to connect the dots. For instance, ALEC has model legislation promoting private prisons. Elk believes the goal is to put massive numbers of people in prison. In the ’80s, ALEC forged a partnership with the Corrections Corporation of America, after which the prison population quadrupled to what it is now. That, in turn, created a ready-made workforce of prisoners working for private corporations. Prison labor provided corporate profits and was cheaper than sending jobs to China, Elk maintains. An unintended consequence, though, was concern over the cost of housing all these inmates. “ALEC found another sponsor that could make money off of getting prisoners out of prison. So what ALEC wants to do now is reform the parole system in this country, privatize it. So now, prisoners have to put up bond with private bail-bond companies that are owned by big Wall Street firms, where they have to pay outrageous fees in order to get out of prison,” Elk says. And ALEC worked with Arizona on its immigration bill, which coincidentally increased the prison population and thus the demand for more prisons. That, according to The Nation, was just what the Corrections Corporation of America wanted. After all, this is the way businesses work: See a need, fill a need—and sometimes, when business is big enough, it could be: create a need.